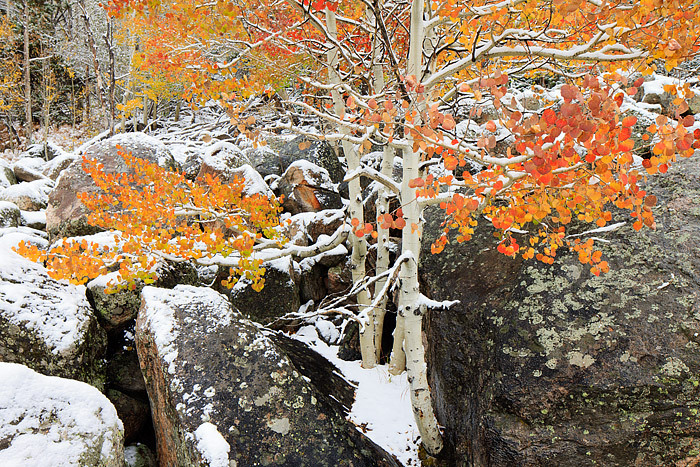 Every few years, the weather conditions in Rocky Mountain National Park come together at the right time to allow for a clash of season to occur. While it's not that uncommon for it to snow during Autumn, getting snow on peaking Aspen trees prior to the leaves falling or being frost damaged is a little more tricky. This particular year, the weather conditons in Colorado came together perfectly. This Aspen tree near Bear Lake Road often turns orange and red as opposed to the more typical yellow. It rests amongst large boulders on the side of the hill. It was quite a challange climbing the icy and snow covered boulders to get to this location but it was well worth it. Photo © copyright by Thomas Mangan.